The thirteen essays in this volume, all by experts in the field of Chinese studies, reflect the diversity of approaches scholars follow in the study of China's past. Together they reveal the depth and vitality of Chinese civilization and demonstrate how an understanding of traditional China can enrich and broaden our own contemporary worldview. 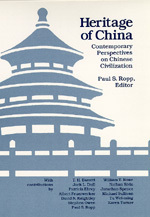 Paul S. Ropp is Associate Professor of History at Clark University.